BANGKOK, Dec. 9, 2011 — U.S. Marines, air­men and sailors worked in tan­dem with their Thai mil­i­tary coun­ter­parts to pro­vide flood relief late last month at the Don Mueang Inter­na­tion­al Air­port here. Marines with the 3rd Marine Logis­tics Group pre­pare to pump flood water from affect­ed areas at the Don Mueang Inter­na­tion­al Air­port in Bangkok, Nov. 29, 2011. The 3rd Marine Expe­di­tionary Force’s flood relief com­mand ele­ment direct­ed per­son­nel assist­ing the Thai gov­ern­ment with flood-relief efforts. The U.S. ser­vice mem­bers and Roy­al Thai sol­diers and air­men trans­port­ed equip­ment from the Laem Cha­bang port to fight flood­ing at the water-inun­dat­ed air­port Nov. 29. Marines and sailors assigned to Com­bat Logis­tics Reg­i­ment 3, part of the 3rd Marine Expe­di­tionary Force’s 3rd Marine Logis­tics Group, per­formed water removal oper­a­tions with the Thai air force. Before the oper­a­tion, Thai air­men placed sand­bags as bar­ri­ers around the airport’s four flood­ed main­te­nance facil­i­ties. U.S. forces pro­vid­ed equip­ment to assist in drain­ing the area, includ­ing hose-and-reel sys­tems, 600-gal­lon-per-minute fuel pumps and vehi­cles to trans­port the equip­ment. 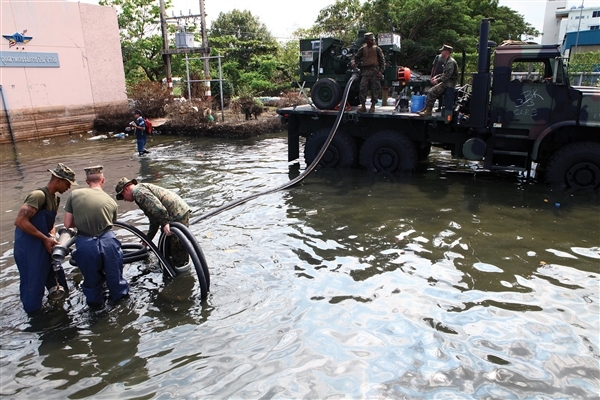 U.S. Marine Corps and Army engi­neers and civ­il engi­neers with the U.S. Air Force’s 36th Con­tin­gency Response Group worked with Thai ser­vice mem­bers, offi­cials said, to deter­mine how to con­duct the flood-relief oper­a­tions, includ­ing rout­ing flood water to min­i­mize the length of hose need­ed, and deter­min­ing the amount of water to be moved. Marine Corps Chief War­rant Offi­cer Julio C. Dominguez, the engi­neer­ing detach­ment offi­cer in- charge with the logis­tics reg­i­ment, said the Amer­i­can and Thai ser­vice mem­bers worked dili­gent­ly dur­ing the suc­cess­ful oper­a­tions.